At the True-Life Taxidermy Studio, your finished trophy is the result of an award winning team collaboration. From skinning to adding the appropriate habitat, your trophies are handled professionally at each stage by an accomplished wildlife artist. 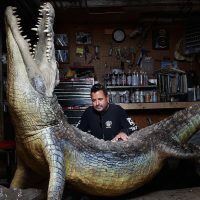 Tony has over 40 years of taxidermy experience, including his years working with the New York Museum of Natural History and has also worked for both Jonas brothers’ under Steve Horn in New York and Joe Kish in Denver. Tony has been with Bob Vitro for the last 14 years. He and Bob have created some remarkable works of art. Tony has multiple awards for his exceptional fine detailed work on large African mounts. Tony has ventured to Africa over a dozen times to do extensive research of the characteristics of numerous African animals. Making death masks, taking exceptional photography in detail has enabled him to collect a tremendous worth of knowledge in his trade. mounting deer heads and advanced to being a Master Taxidermist in recreating the beauty of birds, ducks, and turkeys. Charlie is very good at turning a complicated mount into a breathtaking piece of art. He has won over thirty-two awards from Best Of Category, Jack Wilson Award, Best Waterfowl Award, Breakthrough Award, Presidents Award, Blue Ribbon Masters, & Division of Excellence Award. Charlie is always the first to Thank Bob for allowing him to live out his dreams and have a career that he loves. Dustin is new to the True-Life Taxidermy Team. 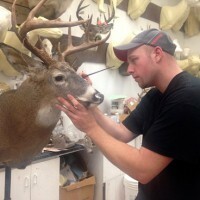 He specializes in mounting whitetails & completing finish work on complicated pieces. He takes the attention to detail very seriously when mounting trophies. Dustin is a wildlife artist, having won many awards for his drawings and paintings. Dustin is a great new addition to our Award Winning Team of Wildlife Artists. Dominick is in charge of all the fish that come into True-Life. He specializes in fish replicas of the highest quality, as well as conventional fish taxidermy using the real skin. All Dominick’s mounts are hand painted. He has years of experience in studying the patterns and colors of all fish species. With his knowledge of a fish’s anatomy he can bring the realism back to your mount. Dominick has won numerous awards for his fish taxidermy work. Every time I look at my Cape Buffalo pedestal mount, I’m transported back to the Caprivi where he was taken. The detail in his expression, the elements of the landscape, and those magnificent horns, everything is presented with such realism perfectly capturing the moment. Due to the size of the animals and our space concerns, we worried that the Eland and Gemsbok stack pedestal mount would be a bit “over the top”, but True-Life met the challenge, the trophies are beautiful – a stunning piece. Bob and his team are wonderful artisans, highly professional, and the nicest people to work with in creating your hunting memories. Thank you!! This Taxidermist beside me is the man that I have hired to do my taxidermy work. I have sent my treasured Musk Ox, the biggest Musk Ox to ever be hunted to Bob Vitro. Believe me I have kept my Musk Ox and have looked everywhere for the right person to mount it. Taxidermy is so important this is why I have chosen True-Life Taxidermy. I use True-Life Taxidermy and so should you. If your looking for one exceptional taxidermist/outfitter that books worldwide take it from one who has hunted from Africa to the Arctic Circle with Bob- from taxidermy work to booking hunts his knowledge an expertise can not be beat, True Life Taxidermy ( Bob Vitro ) from Middletown N.Y.does it all. I want to thank you and your team for the great work you have done for me. The mount will give the memory of that day for as long as I live. It is rare in this day and age that one can get the professional experience you get when dealing with you and your staff and I thank you for that. Bob Vitro is certainly the most outstanding taxidermist that I have ever worked with. His mounts are extraordinary with more attention to detail than I have ever seen. He is also an incredible outfitter, especially his Kansas white tail hunts.. as good as it gets.. and his African Safaris. I’ve been using Bob Vitro and True-Life Taxidermy for over 10 years for all my mounts from Alaska to Africa and everything in between. Bob and his staff have such an amazing attention to detail that each piece of his work seems to come to life again in my trophy room. When non hunters just stop and stare you know that the work is indeed artistry. Bob recently set me up on a Colorado mule deer hunt knowing I was looking for something special. The outfit he recommended was thick with very big deer and I connected with this 180’s buck late in the hunt. From dangerous game in Africa to sheep hunting in Europe and Asia and bears in Russia and Alaska Bob knows the outfitters that get it done. He is mounting trophies from around the world and sees where the best come from. Jim KachidurianThe Kent Group Associates, Inc. Through your talents and artistry, I am able to live the pursuits everyday. I will always be in your debt. The memories become so vivid, and the honor, respect and attention you have given to my specimens supersedes all expectations. The compliments I have received from our peers, as well as professionals that accompany us is added tribute to your allowing the experience’s reincarnation. My sincerest thanks, and wishes for continued excellence. I always look forward to booking the next exciting hunt with Bobby Vitro. His expertise and knowledge in booking hunts with a high success rate and great hospitality make me a returning customer. I pick an animal, my favorite being Whitetail, and he gave me a number of locations that are known to have trophy bucks. Then from there, based on my personal preferences of climate and hunting conditions, I would make my decision on where to book. The process is always smooth and he always has up to date information on where the trophies are being racked up. I met Bob Vitro six years ago when I booked my first safari to Africa. With his wealth of knowledge on the continent, I was confident that it would be an experience of a lifetime…and it was! Since that trip, I have returned to Africa several times all with the support of Safari Specialists. Bob and his team were instrumental in helping me to achieve my goal of harvesting the “Big 5,” and they continue to assist as I book trips in the United States and abroad. In addition, he has skillfully mounted and hand-delivered more than seventy-five animals for my trophy room, which he helped to design. Whether it is a full body mount, head mount or rug you are looking for, Bob will deliver a first-class job every time. His expert knowledge and eye for detail are second to none and I wouldn’t use anyone else. I wanted to take a moment to express my sincerest thanks for an outstanding job you gentlemen did mounting my rainbow trout. This trout was a trophy of a lifetime on such light fly tackle and being caught in a New Jersey river. I was hoping to catch the moment when I had her in my hands and reflect on the vibrant colors and freshness of the fish. To say the least, you fellas’ did just that! I cannot complement you enough on such a fine job. A few friends have seen the fish already and also my wife and all have remarked how it “looks so alive”! I agree. You have my deepest appreciation for such a fine paint job! From this point on, I can assure you that all of my taxidermy needs will be through your shop. Keep up the fantastic work! Bob Vitro and his True Life staff are avid sports men , who understand one remembers the hunt through the trophy. We use Bob for all our store displays, Cav. Ugo Gussalli Beretta’s Museum collection and our clients trophies from our hunting agencies as well, I also have been using True Life to complete my new trophy room (another field that. Bob prides himself in) These are the people to trust your memories to.